UE student Cheryl Zurliene is preparing her homemade chili with fixings tonight for Newman Club's 5:00 p.m. dinner! Following dinner from 5:45-6:30 p.m., Steve Dabrowski, diocesan director for young adult programming, will present on Pope Francis. 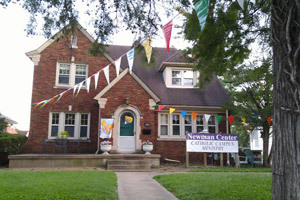 Join us at the Newman Center, corner of Lincoln and Frederick Avenues. Look for the multi-colored pennant flags! Questions? Text or call 812-760-8610. Students of all levels of Spanish are invited to meet at Jazzman's in Ridgway University Center at 4:00 pm on Mondays to practice Spanish in a relaxed atmosphere with Fulbright foreign language teaching assistants from Venezuela and Argentina. The ladies of Zeta Tau Alpha will be at tables in Ridgway University Center on October 19-21 running a Flamingo Fundraiser in order to raise money for Big Man on Campus! To send a flock of plastic flamingos to a friend that lives off campus, in a townhouse, or campus owned apartment/house, the prices will be $10 for 5 flamingos or $20 for 10 flamingos. 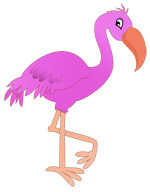 To send a flock of paper flamingos to a friend living in a residence hall, the prices will be $5 a flock or $10 a flamboyance. The flocking will begin on Thursday, October 22. The flocks of flamingos will migrate every 48 hours. There will be an option to pay $10 in order to find out who has sent the flock to you! The Office of Diversity Initiatives' Anti-Bias Team will be presenting a discussion - formally known as the Diversity Dialogue series. This session is meant to bring better awareness to the University of Evansville by helping students achieve an inclusive mindset through dialogue and through debunking the false stereotypes and labeling. "Just Ask Me!" is an LGBTQ discussion on how students identify. It will be a presentation for all students to attend and participate in a discussion about the LGBTQ community. It is important for students to be more familiar with LGBTQ in order to find out more about this community and how they would want to be identified. The presentation will be on Monday, October 19 at 6:00 p.m. in Room 162, Schroeder School of Business Building. All students are welcome to attend and participate in the discussion. “Mapmaker,” an exhibit of the work of artist Katherine Baxter, will be on display at the University of Evansville’s Melvin Peterson Gallery from October 19 – December 11. Baxter will present a public lecture in the Peterson Gallery on Thursday, October 22, at 7:00 p.m., followed by a reception. These events are part of the Emerging Contemporary Artist Lecture Series sponsored by the Efroymson Family Fund and the UE Department of Art. 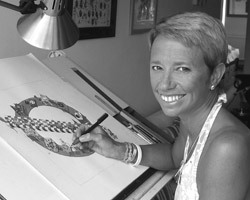 Baxter lives in London, England, where she is an illustrator for newspapers, magazines and book publishing companies including The Times, The Daily Telegraph, The Royal Mail, Vogue, Kingfisher Books, and Good Housekeeping Magazine. She has created private commissions for The Prince of Wales, many American schools, hospitals and universities, and the 2015 Wimbleton. Her interest in “looking at the world from above” began as a young child, and continued after studying at Bath Academy of Art. Her fascination with aerial views inspired her “jewel-like” pictorial maps of architectural vistas of cities, towns and villages all over the world. The Melvin Peterson Gallery, located at the corner of Weinbach and Lincoln Avenues, is open Mondays, Tuesdays, Fridays, and Saturdays from noon - 3 p.m., and Wednesdays and Thursdays from noon - 6 p.m.
Department of Music Chair and Associate Professor of Clarinet Thomas Josenhans and Consortium Instructor of Oboe Elizabeth Robertson will present this week’s Faculty Recital in Wheeler Concert Hall on Tuesday evening, October 20, at 7:30 p.m. Playing together, separately, and in combination with various other members of the Department of Music faculty, the duo will present a program of works ranging from Mozart’s Quintet for Piano, Oboe, Clarinet, Bassoon, and Horn, K. 452, to Eleven Echoes of Autumn, a work for alto flute, clarinet, violin, and piano by American modernist composer George Crumb. The recital is free and open to the public. 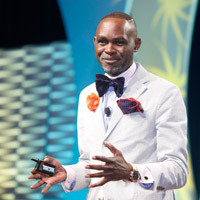 Come hear Derreck Kayongo as he talks about his journey from being a child refugee in Africa to becoming a social innovator on the worldwide stage. Better still, he will share pearls of wisdom that can help you with your own social innovation interests. Kayongo founded the Global Soap Project, which focuses on recycling partially used soap from hotels into new soap for vulnerable populations in Africa, South Asia, and the Caribbean. He was also named Top 10 CNN Hero of 2011. This is an Aces Passport approved event. UE student teams present their ideas for improving Evansville and the world beyond while competing for $3,500 in seed money to help their ideas become a reality. All of the above programs are free and open to the public. Contact ck116 for more information. Writing Center Boot Camp: Academic Writing for International Students: Part 2 will address academic writing tools such as summary, paraphrasing, in-text and reference citation, note-taking, and creating annotated bibliographies. We will also answer grammar questions as requested by students attending. All students are welcome to this useful workshop on Wednesday, October 21, at 5:00 p.m. in the Writing Center. GAP Info Session and Free Pizza on Friday! Students of all majors are invited to attend an information session to learn more about the GAP Program and to hear from previous GAP students about the experience. The session will be held on Friday, October 23 from 12:00 - 12:50 p.m. in Smythe Lecture Hall, Room 170 in the Schroeder School of Business building. Free pizza and drinks will be available. Come find out how you can put your unique skills and talents to work in the real world. RSVP now! For more information, contact the Institute for Global Enterprise at globalindiana@evansville.edu or visit https://www.evansville.edu/globalenterprise/studentGAP.cfm. We invite you to our session on Wednesday, October 21, 2015 from 12:00 pm-1:00 p m with Anna Hargis, executive director of Big Brothers Big Sisters of the Ohio Valley. Her session is titled: "Not everyone is like you: leading through differences." Bring your lunch and meet us in Eykamp 252, Ridgway University Center. Lunch and Lead is a Ted Talk style presentation and discussion session. All members of the UE community are welcome. Meet your future employer at Health Careers Fair 2015. Come to the Student Fitness Center tomorrow, October 20, from 11:00 am to 2:00 pm. All students, freshmen through seniors, considering a health-related career should attend. See registered employers in JobLink (https://evansville-csm.symplicity.com/). Also, pre-register for the event in JobLink to allow employers to view your resume early! The Senior Nursing class would like to invite everyone out to Orange Leaf (Burkhardt location) on October 22, as we will be raising funds for our senior project. The funds we raise will help us to buy hygiene items for children in Evansville who are in great need. Please mention the University of Evansville Senior nursing class to your cashier so that 10% of your bill will be contributed to our project. Thank you! Graves Hall -Classrooms and building unlock at 6:30 am and lock at 9:30 pm on Monday – Friday; 8:00 am – 5:00 pm on Saturday; and closed Sunday. Pick from two Information sessions at 5:30 pm in the Morton Brentano Pit on Tuesday, October 20 or October 27. Stop by to learn more about the position and ask about the application. Any member of the Residence Life staff will be happy to help you! 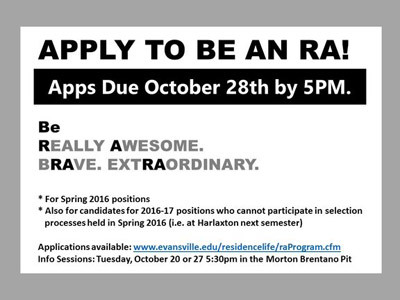 All applicants must fill out an application and have two recommendation forms turned in by October 28. If you're a December Graduate and you missed Commencement Central last week please stop by the UE Bookstore. If you need a cap and gown and/or graduation announcements you should do so as soon as possible. Those graduating with a Masters degree need to stop by the Bookstore immediately as those garments are custom made. This is a friendly reminder that adoptions for the Spring 2016 term and Intersession are now due in the UE Bookstore. If you have any questions please contact the Bookstore. Timely adoptions benefit everyone. Volleyball and Dodgeball Registration Now Open! Volleyball and Dodgeball registration is now open! Sign up on IMLeagues today! The University of Evansville, in pursuit of excellence in service, wishes to recognize a non-faculty employee displaying records of achievement as a leader. Leadership may be demonstrated in any of the following categories: service to the University, service to students, job performance and attitude towards fellow employees. To be eligible, an employee must be a full-time member of administration or staff. Nominations for the November 2015 IMPACT Employee of the Month are due no later than Wednesday, October 21. To nominate someone, go to http://acelink.evansville.edu/tools/employeeaward. Congratulations to our Changemaker Challenge finalists! Mark your calendars: The final pitches will be held on October 29 from 4:30 – 6:00 p.m. in the Ridgeway University Center. The mission of this project is to prevent the mental, physical and emotional abuse of students grades 6-12 in Vanderburgh County by empowering them through education and confidence building. Team aims to create an awareness campaign for the environment. Developing an all-in-one website that will make it easier and more efficient for the citizens and local government to communicate their ideas. Make people more aware of what is going on in local government. Team aims to promote a healthier lifestyle for the Evansville community in order to combat one of the city's biggest issues: obesity. Team is proposing the development of a student led clinic in the Evansville area to serve those in need of medical attention while providing both undergraduate and medical students real world experience. The University of Evansville men’s soccer team (2-10) is on the road for a midweek non-conference matchup at Lipscomb University (4-8-1) on Tuesday, Oct. 20. The match will be held at Lipscomb Soccer Complex and begin at 7:00 p.m. CDT. The University of Evansville women's soccer team (3-10-2) was defeated 4-0 at the University of Cincinnati (10-4--4) on Sunday afternoon. UE’s first shot came from junior midfielder Bronwyn Boswell but her 29th minute attempt was blocked. Cincinnati went ahead moments later with a goal in the 33rd minute of play. The Aces trailed just 1-0 at halftime but the Bearcats added three goals in the second half (56’, 60’, 67’) for the victory. Boswell led UE with two shots in the contest. Senior goalkeeper Simone Busby and junior goalkeeper Whitney Biggs each made three saves. The Aces continue their three game roadtrip at Illinois State (Oct. 25). UE returns home to host Missouri State in the Missouri Valley Conference regular season finale (Oct. 29). INFO: For all of the latest information on University of Evansville athletics, log on to the sport page on GoPurpleAces.com or follow the program on Twitter via @UEAthletics. DONATE: For information on giving to UE Athletics or its individual athletics programs, visit the DONATE tab on the top of GoPurpleAces.com. TICKETS: To purchase tickets for University of Evansville athletics events, log on to GoPurpleAces.com and click on the TICKETS tab on top of the page. The University of Evansville men’s soccer team (2-10, 0-4 Missouri Valley Conference) was defeated 2-0 at SIUE (8-3-1, 2-1 MVC) on Saturday evening. The Purple Aces amassed just one shot on goal in the contest, a 24th minute header from sophomore midfielder/defender Ian McGrath that was saved by SIUE sophomore goalkeeper Kyle Dal Santo. The Cougars broke a scoreless tie in the second half on a header from senior defender Brett Lane in the 64th minute. Ahead 1-0, SIUE tallied another goal in the 80th minute for the 2-0 victory. UE Freshman goalkeeper Greg Niven recorded six saves in the match. McGrath led the Purple Aces with two shots in the contest. Evansville is on the road for their next match at Lipscomb (Oct. 20). The Aces return home to host Missouri State and Indiana Youth Soccer Night on Oct. 24. On a crisp fall morning at Angel Mounds, the University of Evansville cross country teams set several personal records at the UE Invitational. For the Purple Aces, it was their second out of three home meets this season as the program will play host to the Missouri Valley Conference Championship on October 31 at the course. Evansville’s women were paced by freshman Sienna Crews. Her 5K time of 18:56.0 was her best collegiate time, besting her previous mark set last time out at Louisville by almost three seconds. She came home in 18th place overall. Second for UE was senior Elizabeth Kingshott with a final of 19:27. It was her best time of the season and put her 30th in the finishing order. Third across the line for the Aces was Michelle Karp. The sophomore has improved each and every week and set her PR for the fourth week in a row, running a 19:38.4. That topped her 19:52.97, which was Karp’s previous best that she ran two weeks ago in Louisville. Senior Laurel Wolfe was fourth on the squad, checking in at 20:25.6. It was her lowest 5K time of the season and was 32 seconds under her previous best this season. Ashton Bosler rounded out the top five for the Aces, running a 20:54.4. While it was not a PR, it was her top time at the course as it was 18 seconds under her time in the Early Bird Invite in September. Freshman Hayley Elliott had her best collegiate run. Her final of 21:41.2 was good for 78th place, but more important, was 14 seconds under her previous best. Anna Loef (22:00.4) and Katie Beaber (22:20.5) rounded out the team. As a team, UE took 5th place overall and third amongst D1 squad. A total of 108 runners took part in the women’s team. Ross Frondorf paced the Aces men with a season-best time of 28:07.3 in the 8K race. He finished in 54th place out of 103 participants. Ben Woolems was next, running a 28:57.6 to come in 64th. Setting a new PR by 27 seconds was Paul Schwartz at 29:04.2. His old time of 29:31.2 was set at the Bradley Intercollegiate. Even more impressive has been his improvement as the season has gone along. His time on Saturday was 5 minutes and 12 seconds better than his first race at Angel Mounds in September. Vince Cecil also continued to improve. His time on Saturday checked in at 29:16.5 and was 38 seconds under his old PR, which was run at the Greater Louisville Classic, set two weeks ago. Jordan Carpenter was another runner who had his best time with the program. His final of 29:18.3 was two seconds better than his last race at Louisville. Andrew Barrett and James Paul came home in 77th and 78th, respectively. Barrett’s time of 29:26.5 was two seconds away from his best collegiate effort while Paul clocked his lowest time of the season in an 8K race. Matthew Spencer (31:40.7), Jon Ashby (31:49.0) and Daniel Zoufal (33:14.0) completed the UE contingent. The men finished in 8th place. INFO: For all of the latest information on University of Evansville cross country, log on to the sport page on GoPurpleAces.com or follow the program on Twitter via @UEAthletics. Led by Michaela Kent and Ethan O’Rourke, the University of Evansville swimming and diving teams competed at the Indiana Intercollegiates on Saturday morning at Purdue. Evansville’s women came in 5th place with a final score of 130 while the men came in 4th place with an identical finish of 130. O’Rourke had the best day for the men and grabbed their top finish of fourth place in the 100 free. He completed the race in a time of 47.82. He was also strong in the 50 free, recording a finish of 11th with a time of 21.87. He contributed to the top relay finish of the day for the men, teaming up with Cameron Wickes, Jared Stuphin and Prescott Marcy to take 6th in the 200 free relay. Their time was 1:29.30. UE’s top performer on the women’s side was Michaela Kent. She recorded a pair of 5th place finishes in the 200 free and 100 backstroke events. She swam a 1:59.77 in the freestyle race while her backstroke time finished at an even 59 seconds. Mackenzie Harris had a strong race in the 200 free, swimming a 1:59.77. Kent and Harris helped to contribute to the women’s top relay finish of the day. The duo joined Madi Jones and Maja Magnusson to take 3rd in the 200 free relay. They finished in 1:40.49. On the boards, the Aces were strong in both the male and female events. Cory Barnes took 5th place in both the 1 and 3 meter dives. His scores finished at 227.10 in the 1-meter while his other score was a 251.17. Courtney Coverdale registered the top finish of the day for the UE divers, earning third in the 3-meter dive. Her score was a 265.95. In the 1-meter, Coverdale was 5th with a final score of 244.75. The Purple Aces have off next weekend, but will be preparing to face Eastern Illinois on October 31. The Aces and Panthers will swim at 1 p.m. inside Wyttenbach Pool on the UE campus. - INFO: For all of the latest information on University of Evansville swimming and diving, log on to the sport page on GoPurpleAces.com or follow the program on Twitter via @UEAthleticsSWIM. The University of Evansville’s Women’s Tennis team competed in day three of the ITA Regionals on Saturday at Purdue University. Freshmen Marine Darzyan and Doreen Crasta were able to pick up two victories in doubles play on Saturday to lead the Aces effort. The duo bounced back from their loss on Friday with a win over Marta Burgos and Claudia Escribens of Purdue by a score of 8-5. They then backed that victory up with a second win over Janina Berres and Gabrielle Paul of Memphis by a score of 8-4. The duo is set to take on Kim Kermet and Tiffany Tavares of Tennessee tomorrow at an undetermined time. In other doubles action, senior Marina Moreno and junior Andjela Brguljan saw action against Anzhelika Shapovalova and AnastasiaVasiukina of Miami. The pair took an 8-2 loss in the match. They then took on Zina Mehikic and Hayley Wild of Morehead State and were again defeated, this time by a score of 8-6. Mareno continued her play in the main singles draw. After picking up her victory yesterday she took on Sydney Campbell of Vanderbilt on Saturday and was defeated by a score of 6-1, 6-2. Brguljan also saw singles action on Saturday when she took on Tiffany Tavares of Tennessee in the consolation bracket. Tavares was able to take the victory over Brguljan by a score of 6-1, 6-1. She then took on Brittany Huxley of Middle Tennessee and fell again by a score of 6-0, 6-1. Crasta also competed in singles play on Saturday, also in the consolation bracket. Her first match was against Sarah Sediri of Middle Tennessee and fell by a score of 6-4, 6-4. In her second match she faced Kim Kermet of Tennessee and fell in that match as well, this time by a score of 6-2, 6-3. The ITA Regionals are set to resume on Sunday and are scheduled to conclude on Monday. • INFO: For all of the latest information on University of Evansville athletics, log on to the sport page on GoPurpleAces.com or follow the program on Twitter via @UEAthletics. • DONATE: For information on giving to UE Athletics or its individual athletics programs, visit the DONATE tab on the top of GoPurpleAces.com. • TICKETS: To purchase tickets for University of Evansville athletics events, log on to GoPurpleAces.com and click on the TICKETS tab on top of the page. University of Evansville senior Stephanie Cerino had a career night, tallying 16 kills as the Purple Aces faced off against Indiana State. Cerino notched her top collegiate total of 16 kills in 40 attempts as the Aces (7-15, 1-7 MVC) fell by a 3-1 final on Saturday evening. Also playing well were Genesis Miranda and Mildrelis Rodriguez. Miranda tallied 19 kills while hitting .269 and Rodriguez had a great effort with 9 kills in 23 attempts. The duo also finished with 14 and 13 digs, respectively. Four Sycamores (14-9, 3-5 MVC) posted double figure kills, including three players leading the way with 12. Indiana State hit a stellar .387 on the night on their way to the win. A late comeback saw the Aces grab a 26-24 win in the first frame. Kills by Genesis Miranda and Jelena Merseli saw UE jump out to a 2-0 lead before Indiana State took its first lead at 4-3. The Sycamores took a 4-point lead at 16-12, but the Aces would not let them scamper too far away. By scoring the next three points, UE got within one at 16-15 on a Mildrelis Rodriguez kill. They would later tie it up at 17-17 on a Kim Deprez service ace. Indiana State looked to be on the cusp of a win, up 23-20, but Evansville rallied back with four in a row. Three of those points came via Miranda kills. After ISU tied it up at 24, back-to-back kills by Miranda and Rodriguez gave the Aces the 26-24 win. After letting a late lead slip away in the opening set, Indiana State took a 10-4 lead in the second game and went on to tie the match up at 1-1 thanks to a 25-12 victory. Indiana State looked to be on their way to another victory as they took a 10-4 lead early in the third set. Evansville never gave up and got back within two at 19-17. Rodriguez posted two kills in a row to bring the Aces back. Minutes later, UE was down 21-18, but three kills in a row saw Evansville tie it up at 21-21. The Sycamores were able to regroup, though, and clinched a 25-22 win. In the fourth frame, the Sycamores capped off the night with a dominant 25-11 win. Evansville returns to the Carson Center next weekend where they will play host to UNI and Drake on Friday and Saturday. Both the men’s and women’s golf squads for the University of Evansville will travel to Kettering, Ohio on Monday and Tuesday for the Dayton Flyer Invitational. NCR Country Club will host both event as the men will play on the South Course with yardage being 7,055 and par at 71. The women will play the North Course and will see 5,869 yards and a par of 70. Both the men and women will play 18 holes on Monday and Tuesday for a total of 36 holes. Men’s teams playing include: Butler, Cleveland State, Dayton, IPFW, IUPUI, Loyola, Miami Ohio, Morehead State, Northern Kentucky, Oakland, Robert Morris, St. Bonaventure, Valparaiso, Wright State and Youngstown State. On the women’s side, the participants will be: Bucknell, Central Michigan, Cleveland State, Dayton, Detroit, Eastern Illinois, Findlay, Grand Valley State, IPFW, IUPUI, Northern Kentucky, Oakland, SIUE and UIndy. For the Purple Aces men, this will be the final tournament of the season. Sophomore Tyler Gray shot the lowest round of the day for the guys, firing a 1-under 69 to lead the Purple Aces to a tie for 6th place in the Donald Ross Invitational last week. Gray and senior Rick Voyvodic registered the top finishes for UE, tying for 12th place with scores of 213. Following a 72 in the opening round, Gray finished with scores of 72 and 69 to finish just three over par in the three rounds of play. His 69 was the lowest round of the tournament for Evansville. Voyvodic also had a strong tournament. He opened up with a 70 before shooting rounds of 72 and 71 to also check in at three over par. Wil Pahud tied for 39th place with a final tally of 220. He improved in each round, carding a 75 to begin the event before following it up with rounds of 74 and 71. Two weeks ago, the UE women played in the Butler Fall Invitational. Kayla Katterhenry paced the women once again, tying for sixth place with a score of 148. After finishing the opening day with a 77, she was able to improve by six strokes last Tuesday, registering a 1-over 71 to finish with a 148. She finished just three off of the win. Lauren Tibbets of Butler and Keilich Katharina (UIndy) finished atop the individual standings. Maria Pickens took second for the Aces. After leading UE last Monday, Pickens completed the second round with a score of 74 to finish alone in 10th place with a 150. Third on the squad was Giulia Mallmann. The sophomore tied for 17th after rounds of 78 and 77 saw her finish with a total of 155. - INFO: For all of the latest information on University of Evansville golf, log on to the sport page on GoPurpleAces.com or follow the program on Twitter via @UEAthletics. The Naismith Memorial Basketball Hall of Fame announced today the 20 watch list members for the 2016 Kareem Abdul-Jabbar Center of the Year Award. Named after Hall of Famer and three-time NCAA Champion Kareem Abdul-Jabbar, the annual honor in its second year recognizes the top centers in men’s college basketball. A national committee comprised of top college basketball personnel determined the watch list of 20 candidates. Included among the 20 candidates is University of Evansville senior Egidijus Mockevicius. The native of Lithuania has been a stellar performer in his career with the Purple Aces and has led the Missouri Valley Conference in rebounding in each of the last two seasons. In 2015, Mockevicius was named a First Team All-MVC player. Kareem Abdul-Jabbar played for legendary coach John Wooden at the University of California, Los Angeles from 1966-1969. He is a three-time NCAA Champion who earned numerous accolades including three-time Final Four Most Outstanding Player, three-time National College Player of the Year and three-time Consensus First-Team All-American (1967-1969). By mid-February, the watch list of 20 players for the 2016 Kareem Abdul-Jabbar Center of the Year Award will be narrowed down to just 10. In March, five finalists will be presented to Mr. Abdul-Jabbar and the Hall of Fame’s selection committee. The winner of the 2016 Kareem Abdul-Jabbar Award will be presented at the ESPN College Basketball Awards presented by Wendy’s from Club Nokia in Los Angeles, CA on Friday, April 8, 2016. Broadcast information will be released at a later date. Last season, Frank Kaminsky of Wisconsin was named the inaugural winner of the Kareem Abdul-Jabbar Center of the Year Award. For more information on the 2016 Kareem Abdul-Jabbar Award, log onto www.HoophallAwards.com. - INFO: For all of the latest information on University of Evansville men’s basketball, log on to the sport page on GoPurpleAces.com or follow the program on Twitter via @UEAthletics_MBB. The men's basketball program is looking to add a reliable student who would be interested in becoming a student manager! Those interested should contact Mike Dashner at md195@evansville.edu or 812-488-3800.